A disembodied horse head—one that still speaks. A princess who doesn’t lift a finger to stop her identity being stolen, and then never tries to end the nightmare and go back home. A queen who sends her daughter away for an arranged marriage, and then makes no effort to contact her again. These were only some of the massive plot holes I had to fill when I looked at retelling the Brothers Grimm tale, The Goose Girl. In addition to ensuring that the narrative makes sense to modern readers, one of the challenges of a retelling is that it needs to bear some striking similarities to the original tale. Yet at the same time, it also needs to bring something new, some insight concerning character or setting that hasn’t been tried in the framework of this particular narrative. For my story, I decided to center both of these issues on the character, Falada, who in the original tale is a severed horse head that’s been nailed up near the gate to a castle. The steadfast loyalty of the original Grimm Falada touched me, but having that character immobilized in that fashion imposed crippling limits on the narrative. So I waved my magic story wand and made Falada instead into a living kelpie. Still horse-shaped when she wants to be, but she’s no longer stuck in one place. It brought something new to the tale while still preserving the idea of a faithful equine companion—one who remained steadfast when all others were gone. The next change was to give the princess in my story—Jentelle—more agency. The princess in the Grimm tale was merely carried by the narrative. We empathize with the original character—that her life has been stolen by her scheming lady-in-waiting—but I wanted my princess to do more than simply endure. So I made my princess half-siren. That gave Jentelle and Falada something in common—a love of the aquatic life of the river—and it bound them together with the strength of their secret lives. From that I could build a believable friendship, which became the emotional heart of my tale. That sort of connection is important to me as a writer. It’s not enough to create a believable plot from an improbable scenario. For some reason, to make a story work in my head it needs an emotional hook, some theme that has been of real importance in my life. And in one way I’m a very typical woman—family relationships and friendships have formed an integral part of my life. Just knowing I can pick up the phone or type out an email, and someone who cares will get back to me—that’s a huge comfort. I might spend a great deal of my time working by myself, but I’m not alone. Not only was this element something I could use to really throw my heart into telling this tale, but friendships between female characters are strangely underutilized in fantasy. Frodo and Sam have been iconic for decades, but we have no female companions of similar stature, which I think is a shame. Despite this, however, the story’s not really a feminist statement—other than the whole “we are here” bit, which is as didactic as I care to get. Stolen Legacy has numerous action sequences, betrayal, and a love story, but the friendship remains at the heart of the tale. I hope it’s something that anyone who’s ever had a close friend can relate to. I think that most of us write about what we know to a large extent, Cathleen. My son shares your sadness. He loves Lord of the Rings. I didn’t realize Stolen Legacy was a revisionist fairy tale, Cathleen! How cool! I’m actually working on one of those myself — a “here’s the part of the story you didn’t see” project, à la Wicked and Maleficent. They are tricky, because you have to observe/honor the boundaries established by the classic narrative, but do it in a way that sheds new light on context on those characters/events. I’m excited to see how you’ve re-envisioned The Goose Girl! When it’s done right, you get Wicked. (And Once Upon a Time has been a big hit, too.) Revisionist fairy tales are hot right now. Not that I’m suggesting we chase trends — never — but if you’ve got a new take on a familiar piece of folklore, that’s worth pursuing. As soon as I’m done with my WIP (a contemporary urban fantasy), I’m going to start cracking on my own revisionist fairy tale (I already have a 45-page prose outline with the entire story mapped from A to Z). It can be great fun to play in the sandbox of popular folklore. Well, I have eight novels written and in various stages of revision that attempt this very thing. Snow White and the Civil War (2 volumes), Hans and Greta, (set in California during the Great Depression, 3 volumes), and Bleeding Kansas Rose, retelling Snow White and Rose Red in two volumes. And Bellerophon, a Greek hero myth set way back in the Bronze Age. 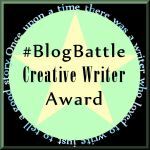 Bellerophon and Snow White are pretty close–I should be publishing them next year. I’ve also got a high fantasy with my very own world building that I’ve been sitting on writing, but it just seems like I should finish what I’ve already drafted and partially revised first. I’ve been keeping myself sane by penning the odd short story and promising myself better things once I’ve worked through my editing pile. Cathleen, somehow I missed that Stolen Legacy is a retelling of The Goose Girl, and that retelling classic tales is your genre of choice. How did I miss this? Providing more dimension is the only reason for retelling any well known tale, and fairy tales can always use more insight and depth. I was interested in your stories before – now I’m really interested. Hi Cathleen! 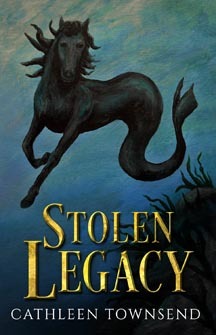 I loved Stolen Legacy and I need to get a review written. I also did not know that it was a retelling of a fairy tale–such interesting fodder for more stories. I loved Jentelle and Falada and already knew something about sirens and kelpies from mythology. Thank you for posting this update and the behind the scenes look at your creative process. I wish I had more time to read right now, your other books will be getting on my TBR soon! I do enjoy retells and I will have to download your book. My first foray into short stories was retells of Greek myths. No problem, Cathleen. I still playing catch up myself! I love reading the stories behind the stories, it’s great insight into author’s thought processes and it can be so fascinating! It’s a sad issue with folklore tales that through constant telling and retelling all the character nuance and motivations that probably once existed get slowly worn away until you’re just left with plot-points and no idea why this seemed like the best course of action to take! That’s why I’m so happy that we’re going through a time of pulling all those old stories back out and dusting them off to retell them again, putting the characters back into their own plots!